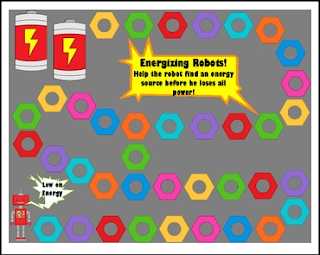 Energizing Robots Multisyllabic Game! There are two ways to play this fun game while practicing speech articulation. Rules & Directions: The robot is low on energy! Help him find more energy before his batteries die out. The player to get to the battery energy supply first is the winner of the game. As each student takes a turn, have them practice their target word at the word, phrase or sentence level. Print out all the picture sound cards, laminate and cut out (cardstock is best for durability). Print out the game board and laminate for durability. Print out the die template and assemble (you may be able to laminate). You can use the picture articulation cards and play as a card game. The person to collect all the robots (all the colors) wins the game. If you pick up a “metal screw” card, you have to put a card back because one of your pieces is loose. Earn an extra turn if you pick up the “battery” card because you found some extra energy.